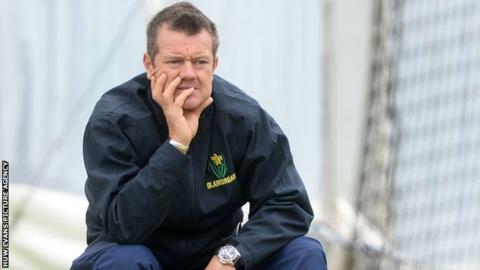 Coach Toby Radford says Glamorgan face a "lot of practice" after they suffered their first defeat of the season against Hampshire at the Ageas Bowl. The Welsh County lost their County Championship game by six wickets after being dismissed for 224 and 187. Hampshire reached their target of 67 before lunch on the final day, although Ruaidhri Smith took 3-38 for Glamorgan. "It was always difficult coming back from posting just over 200 in the first innings," said Radford. "We're just not getting starts in the innings - we were 9-3 in the second innings - and to fight back from there is very tough." Radford, who was appointed last autumn following the departure of Matthew Mott, said his team did not recover after being put in to bat in tricky conditions on the opening day. "It was a little bit damp on that first morning and we certainly would have wanted to bowl first," he added. However, Radford said he was not overly concerned by his batting line-up's lack of runs. "I think England in April and May is the toughest place to play cricket in the world, because you do get a lot of swing and seam movement," he said. "In some ways now we have a week's break, we move into Twenty20 cricket and we'll have a lot of practice next week. "I'm hoping when the next Championship game comes up against Leicester that one or two have found form and a bit of confidence. "We know that our big players - our Jacques Rudolphs and Murray Goodwins - are going to come good. "It's just that at the moment they can't find their form but we know it's coming, we know we'll post some big scores and we know there are wins on the way. "So I don't think anyone's worried about it. You just want to get there as quick as you can." However, Radford praised his bowlers and 19-year-old all-rounder Smith in particular. "I was very impressed with the way Ruaidhri bowled," Radford said. "He managed to get rid of [Michael] Carberry and [Jimmy] Adams - two very experienced opening batters. "It was a very good spell with the new ball and he showed signs of being a very good young bowler." Glamorgan face Hampshire again on Friday, 16 May in their opening T20 Blast game of the season, followed a week later by a game against Essex in Chelmsford in the same competition. Leicestershire then visit the Swalec Stadium for a County Championship game on Sunday, 25 May.